Louisiana Conference: U.M. Army heading to Louisiana! U.M. Army heading to Louisiana! 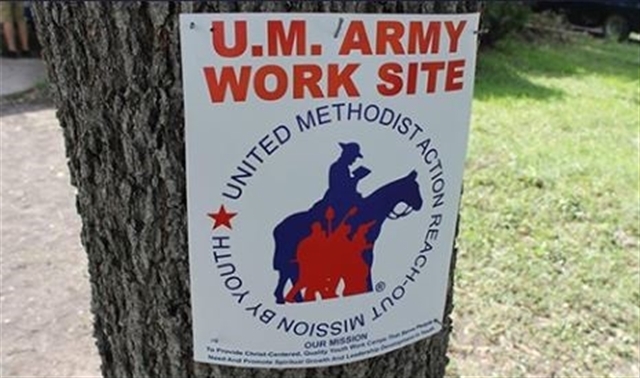 Armed with hammers and paintbrushes, hundreds of workers with a mission will descend on the Bossier City (June 15-21) and Ringgold (July 20-26) communities in the Louisiana Conference as part of U.M. ARMY (United Methodist Action Reach-out Mission by Youth). Youth age volunteers and accompanying adults each pay to spend a week helping those unable to help themselves. They will be busy with wheelchair ramps, handrails, porch work, painting, minor roof repairs and much more. U.M. ARMY, which has been serving low income, elderly and disabled individuals since 1979 in Texas, and since 2000 in Louisiana, is working to establish a stronger presence in our conference. Brian Smith, U.M. ARMY National Executive Director, participated in the first mission camp in Alexandria, La. in 2000 and is encouraged by those working towards chartering a Louisiana U.M. ARMY Chapter. He noted that Bishop Cynthia Harvey served as executive director early in the life of the organization in Texas. “U.M. ARMY has been described as the best of a summer camp, mission project and spiritual retreat all wrapped into one,” said Smith. Currently, U.M. ARMY is offering an incentive to help new churches grow with the mission ministry by joining forces with them during the 2014 season. To do so, they are offering some scholarships for smaller groups, or a $50 discount per participant for larger groups. Referrals for work to be completed are given to U.M. ARMY by state agencies, local churches and community organizations. More than 5,000 participants will compose U.M. ARMY this summer in 60-plus cities, helping an estimated 2,200 needy families. While in Louisiana, participants will stay at Asbury United Methodist Church in Bossier City and First UMC in Ringgold. Some of the current participating churches are McGuire UMC, First UMC in Monroe, First UMC in West Monroe, and Wesley UMC of Sulphur, as well as several seed churches from the Houston area. In addition to Louisiana, U.M. ARMY has camps this summer working throughout Texas, Massachusetts, New York, New Jersey, Pennsylvania, Rhode Island, Maine and Vermont. Camps have also been held in Florida, Illinois, Oklahoma and Washington. For more information about U.M. ARMY, visit the website at umarmy.org or contact Brian Smith at (877) 771-9484 or briansmith@umarmy.org.